Imagine the look on her face when she is greeted with a surprise delivery- an elegant Hollywood box embellished with ribbon. 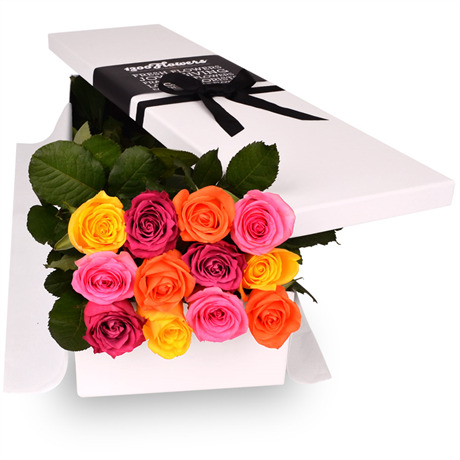 Imagine the anticipation as she opens the lid, revealing a dozen velvety roses in the tones of deep ruby, fuchsia pink, sunshine yellow and creamy white. Now picture her elated happiness as she views the twelve spectacular roses chosen especially by you, simply to show her how much you care. Women everywhere love receiving roses because it makes them feel both loved and appreciated. Painstakingly inspected to ensure absolute perfection, the Sierra is the tour de force of romantic gifts and is the ultimate expression of love. We recommend accompanying these sultry roses with a stylish vase for her convenience. When there are no words to express your feelings, let the Sierra do the talking.